Photo 1: Square braid, 6 loops, all bicolor, two different patterns. Learn how to braid these square braids from my Start Here–5 loops, and Continue Here–7 loops tutorials. In this post, I’m just showing the color set-ups for some specific color-patterns for these square braids. 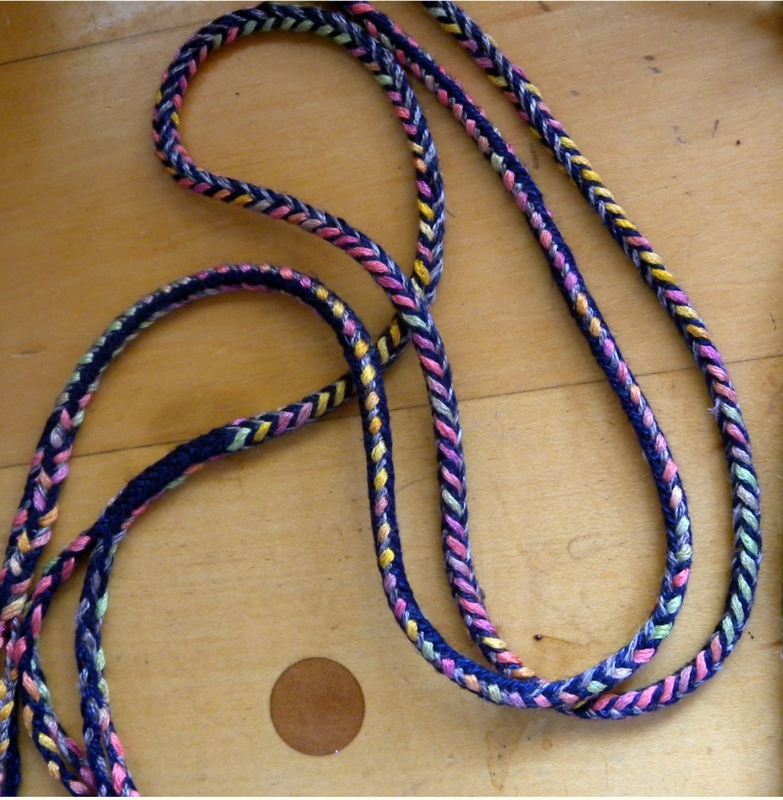 Photo 1, above: 6-loop square braid with 2 color patterns (Pattern A and Pattern B). I used what I had on hand. My variegated yarn was a silk knitting yarn with a mix of light rainbow colors, my black was a slightly thinner linen yarn, and my gray was a different brand of linen, doubled to be approximately the same size as the black. (unknown brands) You don’t need to use these exact yarns or thicknesses! A variegated yarn of light colors will give a mix of colors down the braid, and will contrast well with the black. If you don’t have a variegated yarn, substitute a light or bright color you like that contrasts well with black. Black lengthwise stripe along two sides of the braid, with alternating variegated and gray on the other two sides. Left hand: A, B, C Variegated/black loops with black shanks uppermost on the fingers, variegated shanks down. Right hand: A, B, C Gray/black loops with gray shanks uppermost, black shanks down. Black V’s, alternating with variegated + gray V’s. A black up/gray down, B varieg.up/black down, C black up/gray down. Braid a 6-loop square braid. This is halfway between a 5-loop braid and a 7-loop braid. Start with three loops on each hand. Braid as taught in my 5 and 7-loop tutorials. The little finger of one hand will be the “loop-fetcher”, while on the other hand it will be the ring finger that fetches loops. This may sound confusing, but it will become clear while you are braiding! Both color-patterns require an even number of loops. They would also look good in an 8-loop braid, see my 9-loop tutorial to learn the braiding method for the one hand that will use a thumb. Note: In the photo, the two ends of the braid (lower left) look different because they were each divided to form a loop, and then divided below the loops into a fringe of smaller braids. The all-black section is a loop (black shanks uppermost on all fingers, no transfers turned). This braid was started from the center, not at one end of the braid. See my Bicolor Loop Magic post for a tutorial on using bicolor loops to make a variety of patterns within one braid. See my Color-Patterning post for more color-pattern set-ups for square and flat braids of 5 and 7 loops. Photo 2: upper braid is a 9-loop square braid, single and bicolor loops, perle cotton. Lower braid is Pattern A from first set of instructions above. Right hand: Thumb, A, B, C bicolor loops with gold shanks uppermost on fingers. Most of the braids in the photo below can be made with almost any number of loops, at least in an approximation of these patterns. (All except the purple/ green braid with white and red areas – it’s an 11-loop variation of the 9-loop pattern taught above). The others are variations of one pattern: Bicolor striping plus contrast single-color loop(s). It turns out like a slanting ladder-like pattern if the contrast single-color loop matches one of the two bicolors. If the contrast single-color loop contrasts with both bicolors, it will show up like V’s or ‘zigs’ across both bicolor stripes. All loops pink+black bicolor with BLACK shanks uppermost on fingers. All loops but one pink+black bicolor, with PINK shanks uppermost on fingers. It actually doesn’t matter which hand or finger the all-pink loop starts out on. Braid as for a square braid. The gray and white braid at the bottom has the same basic setup, but with bicolor loops of gray+white, and a single-color loop of magenta. In this braid, the single-color magenta loop contrasts across both of the lengthwise colors, so it creates 2-column magenta ‘chevrons’ rather than single-column ‘slashes’. I actually like this braid a lot, but am slightly embarrassed to show pics of it! My green, purple and (I think) the red loops were fine gauge linen, while the white loops were a very slippery fine gauge silk twist, which was a bad combination of textures. The silk and linen tended to slip over/ under each other and get ‘lost’, so this braid looks a little sloppy to me. I think the pattern would stand out more clearly with embroidery floss or other threads that are less slippery than this combination. 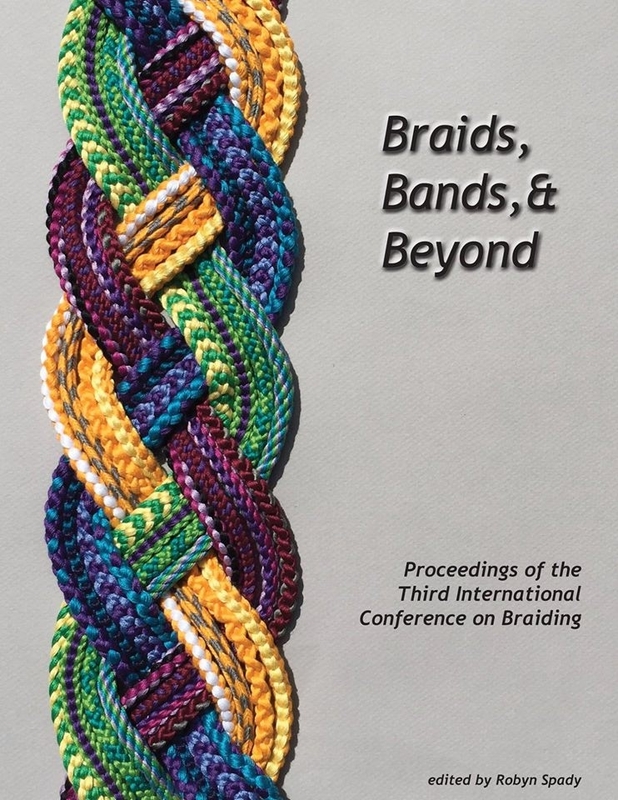 That issue of I mentioned above about threads slipping under other threads and getting “lost” on the surface of the braid is less of a problem in braids that have more complex interlacing than square braids. For instance, spanish or double braids. Square braids have fewer “interlacements” across the braid, no matter how many loops are used. That’s because there are only two braiding moves in each row/ braiding cycle. They create the two braided columns on the top surface, and the two columns on the bottom surface of the braid, regardless of how many total loops are in the braid. In a 5-loop square braid each pass of a thread goes over or under only two other threads. * In an 11-loop square braid, each pass of a thread makes a much longer float across those four columns—stretching over or under five other threads. So it has the potential to be a little ‘messier’ than a square braid of fewer loops, especially with fine high-twist threads. I don’t mean this as a long-winded excuse for my messy braid! Just an fyi on how square braids of more loops differ from square braids of fewer loops. They can have much longer and more complex color repeats!—like the alternations of 5 black and white loops set apart by 4 bicolor loops in the braid in photo 2. You can’t get that pattern in a 5 or 7-loop square braid. But they aren’t any more complex than smaller square braids in terms of their “architecture”—their braided structure. Their threads just have longer floats over the same 4 columns/ ridges as in a 5-loop square braid. *not including a little extra “over one” where loops are turned on the edges of the braid. See full copyright restrictions and permissions at the bottom of the sidebar (n.b. – If you are on a small screen, the ‘sidebar’ may appear somewhere other than the side of your screen). October 14, 2013 in Color patterns, Easy braids.